“De-” is a latin prefix used to indicate removal and separation. “Impression” is a strong effect produced on the intellect, feelings, conscience, etc. An “impression” is also the first and immediate effect of an experience or perception upon the mind that can also be produced by influence. In simpler terms: to us, a “de-impression” is the removal and separation of the impressions people may have of you that you did not give them permission to have. “De-impression” can also mean teaching yourself not to make assumptions on what you “believe” you know about someone without clarification. Misunderstandings, assumptions without clarifications, and unfair judgements all based on impressions and our perception of others, and their impressions and perceptions of us as well. 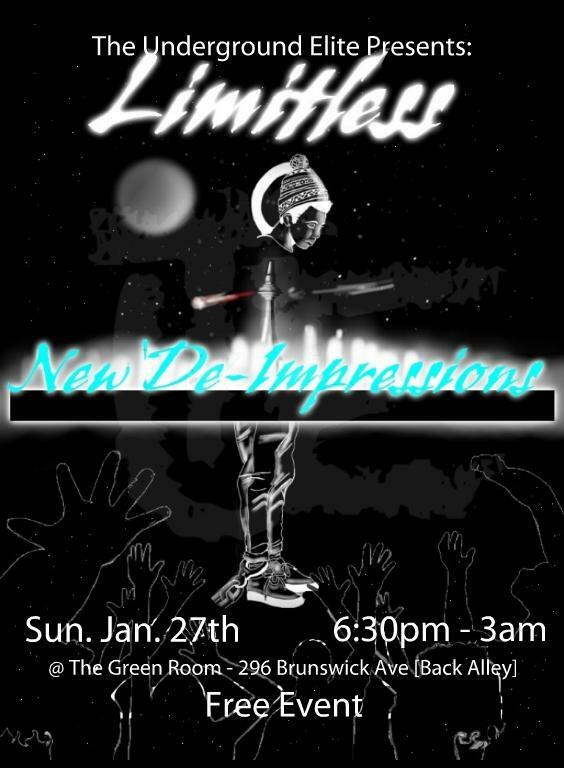 Sunday January 27th 2013, The Underground Elite would like to share this term “De-Impression” with everyone, while also giving our performers and guests a chance to “re-introduce” themselves to the world and into 2013 in the manner in which they choose. The night will consist of tons of performances from  local Toronto artists, lots of giveaways, networking with local businesses, and an awesome after party inside The Green Room just for everyone to network and celebrate life.